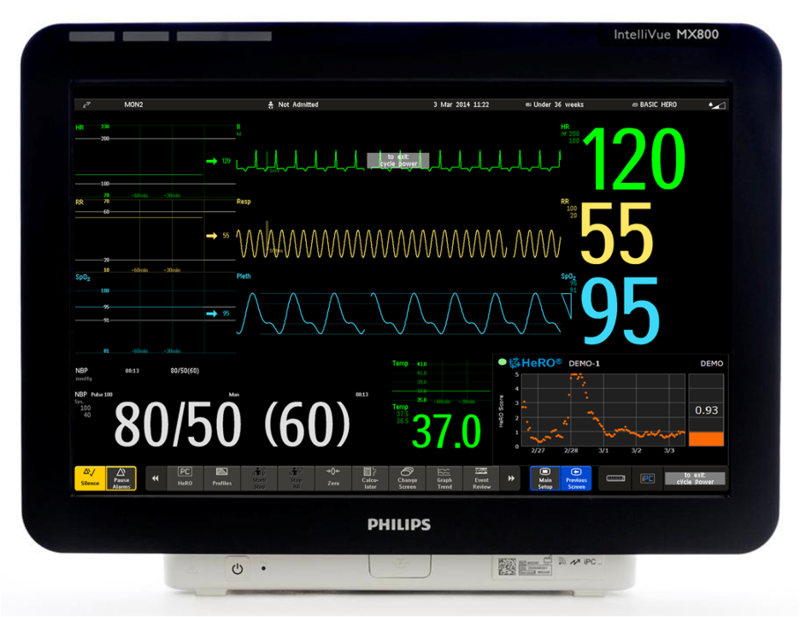 Uniquely for the Philips MX platform of monitors, MPSC offers HeRO ES, which with the iPC, displays HeRO on the physiological monitor. HeRO ES displays directly within the physiological monitor. HeRO ES requires no additional cables. HeRO ES works only on the Philips MX700 and MX800 monitor with the Philips provided iPC. HeRO ES requires that the Philips MX700 or MX800 monitor is equipped with the iPC option. HeRO ES is sold through MPSC and its distributors. The iPC is sold by Philips. Optionally, HeRO ES can be enhanced to integrate with HeRO Symphony, thereby offering central monitoring and electronic medical record export through HL7. HeRO ES displays as another vital sign on the screen of the monitor. For more information about HeRO ES: Download a copy of our HeRO ES product flyer.